When I was 10-years-old, my focus was getting good grades, playing dress up with my friends, and my new role as a big sister. And while I believe that I have embodied my entrepreneurial spirit since a very young age, it never occurred to me to actually launch a scalable business at that age. But that is exactly what 10-year-old Abi Smithson is doing. It was the summer of 2013. Then 8-year-old Abi had just returned home from Girls Learning Code Inventor's Camp when she noticed tan lines on her mom's feet. She commented on how ugly the tan lines were and wondered what it would be like to have a pair of shoes that left heart-shaped tan lines instead. Abi took her vision of a sandal company to her parents and they said what most parents would never say, "Ok, let's do it!" This is how The Love Sandal was born. "My dad and I read a book to help guide us through making a business plan. Once it was done we approached a designer and had the first round of prototypes made. But they weren't what I was expecting. We had to hire another designer to redesign them. Perfecting the prototypes has been very complicated." In addition to heart cut-outs on the top of the sandal, Abi designed The Love Sandal with a heart pattern on the sole of the shoe that leaves heart imprints in the sand. The same pattern is embroidered on the insole. Abi's preliminary successes as an entrepreneur are impressive, especially considering her age. In October 2014 she turned to crowdfunding to raise $15,000 towards developing her product. This included a donation of $8700 by UPS Canada to help her reach her funding goal. UPS became the official shipping sponsor of The Love Sandal. She was also one of three recipients of the first-ever Barbie Business Bursary award in February 2015. The $2500 award helped Abi place her first order of 2000 shoes that is anticipated to arrive in June. Abi was named a Toronto Top 20 under 20 by Post City Toronto. Every entrepreneur knows that isn't all fun and games, which Abi knows all too well. "It's fun working with more than just friends and teachers. But also sometimes boring sitting in meetings and talking about business. My favorite part of being an entrepreneur is getting to see my products in person and feel them in my hands." 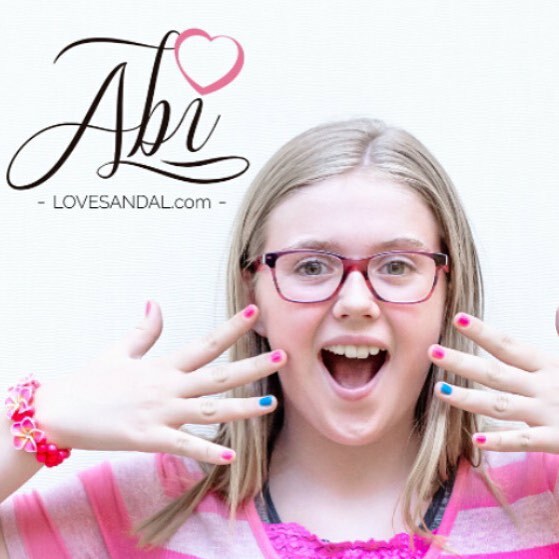 Abi's vision is very clear that The Love Sandal isn't just a shoe, it's a way of life. "I want people to feel comfortable, loved and beautiful when they wear The Love Sandal." Also very clear are her goals. When asked what she wanted to accomplish in 15 years she didn't hesitate, "I want to walk down the street and see people walking with the shoes. I also want to open a love store, buy a pink Ferrari, inspire young people, meet Katy Perry and be on Ellen." Never having to sit in a cubicle, because that is really boring. Being able to fail over and over and still have the courage to get up and start again. Working harder and smarter than everyone you know. Making it big, crashing big and being happy regardless. The only way to truly live a life you were meant to live. 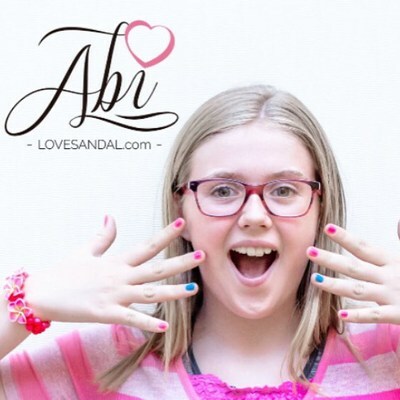 Abi recently received her first shipment of 1000 sandals, and is ready to take the world by storm - a love storm! "The past three weeks have been amazing! I got my first two retail customers in Muskoka, Ontario and I am going to the FN Platform / Magic Show in Las Vegas in August. I already have a meeting booked with a buyer from Nordstrom. I am so excited to see my sandals in big retail stores!" Follow along Abi's entrepreneurial journey as she continues to grow her business and spread love around the globe on Instagram @TheLoveSandal.